Why is Tata Motors deleting features from its new cars? Re: Why is Tata Motors deleting features from its new cars? Why did you even revive a dying product like Aria and christen it Hexa? To capture market or to make a fool out of yourself? You’re killing your own product for the second time, good luck with that! The Aria was a capable vehicle let down by poor marketing strategy and pricing. The Hexa is a moderate success considering the fact that it sells about 800 units a month, compared to 25 of the Aria. It's a highly underrated vehicle for what it is. Was talking with a Tata Motors dealer sales general manager yesterday, after booking a Tiago XZ+ petrol. Nice knowledgeable chap. He too was bemoaning the de-contenting fetish of TML of late. The hardest hit, as per him, is the HEXA XE which apparently has anything that is worthwhile, removed as standard equipment. He was worried, very worried about moving the XE's he has in stock, off the showroom floor. Especially after the Marazzo has joined the fray. My brother in law just purchased the Nexon. While I was aware of this feature deletion thread and post the test drive (on a vehicle that had everything) had a quick look at this thread and had reviewed the things that we would be missing, unfortunately had missed the deletion of the option to view the rear via the rear camera when driving. My brother in law was looking for it and that's when we realised that it had been removed. While I did not find it a very useful feature, what really irritated me was that the SA during the test drive spent 5 minutes just talking about this, saying how great it was and how useful it was. Note to Tata. If you are deleting features make sure it is conveyed properly to the dealership so that they don't knowingly or unknowingly mislead customers showcasing features that are no longer available in the current crop of cars. Do they even bother updating their brochures with the missing features or are they peddling these cars with an old brochure? With Tata going wild with feature deletion spree, what has happened with Tiago JTP is absolutely amazing! 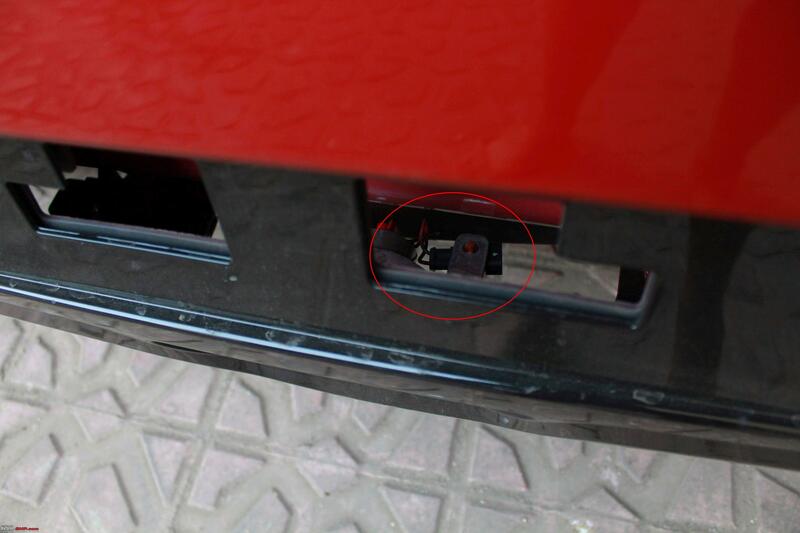 So Tiago JTP has a rear fog lamp which is great since regular Tiago does not come with rear fog lamp. Surprisingly though, the switch to turn the rear fog lamp on is missing on the dashboard. Whoever designed the rear bumper incorporated fog lamp in it but forgot to tell others to make sure there is a switch to turn it on! The connector coming out of fog lamp hangs empty like an orphan. 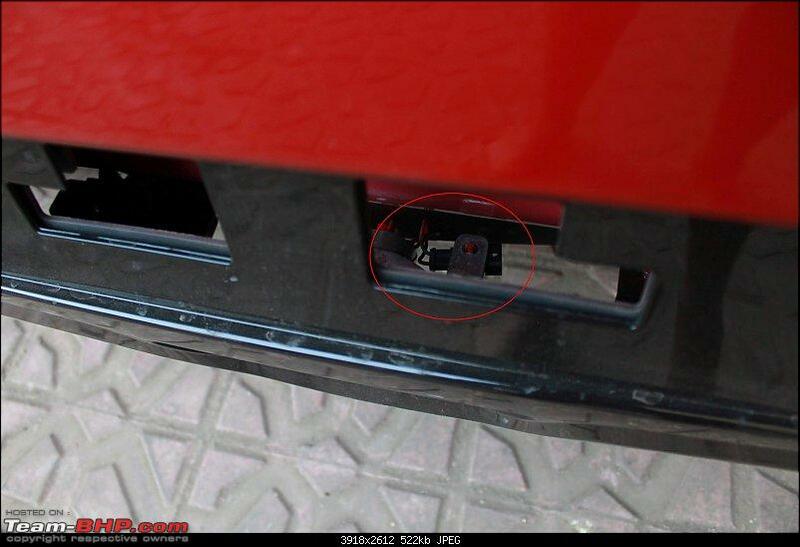 Effectively, the car has a rear fog lamp technically, but there is no way to turn it on. Rather than commit this snafu, Tata could have gone ahead and not put a rear fog lamp and saved whatever pennies they are after. 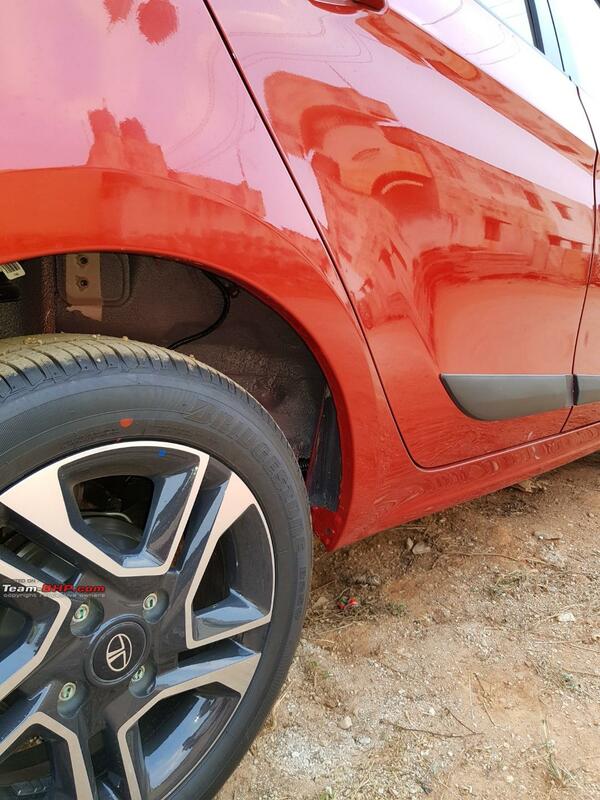 - i think Tiago 2018 batch runs the same PETROL engine as the Tigor ( that is with the added balancer shaft of the tigor)- both have the same level of smoothness and sound the same - this might have pushed up the BOM for Tata on the Tiago - hence the business decision to pass on costs Vs cut features to maintain the price tag??? Thanks to Mohamed Fardeen for sending this information in. Heartfelt gratitude for sharing it with other enthusiasts via this Team-BHP page! Found something alarming when I went to a Tata stockyard to pick a color for my booked Tiago XZ+. 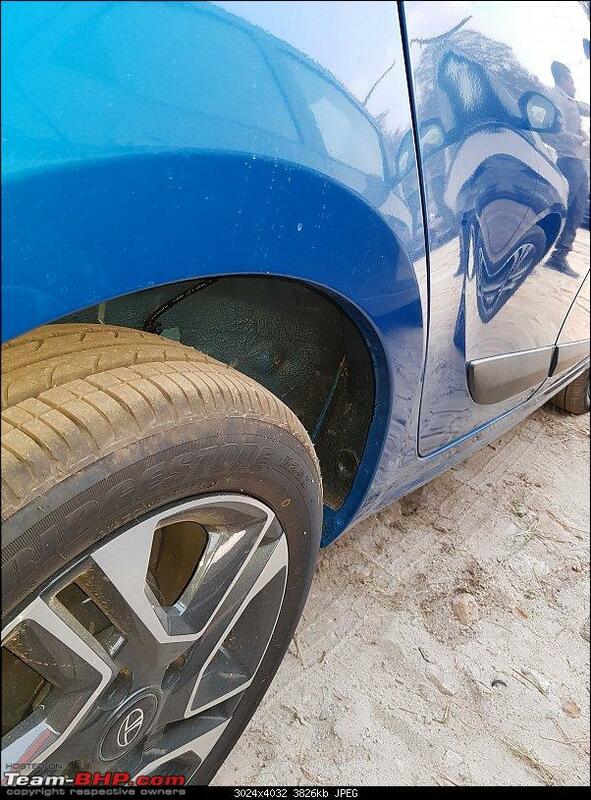 It seems that Tata Motors has simply removed the rear wheel well cladding in order to cut costs for the 2019 Tiagos. This is ridiculous as the same stockyard had a (presumably older) XZ variant with the cladding. It's a stupid move by Tata as it is instantly noticeable to a keen eye - looks UGLY. All of this is absolutely unacceptable from Tata. Even the dealerships weren't informed. What were they thinking by compromising on quality like this? Last edited by GTO : 11th February 2019 at 14:32. Why are we drawing a conclusion that this is a "cheap" and "stupid" move? There an be several reasons why they have chosen to not to add it. 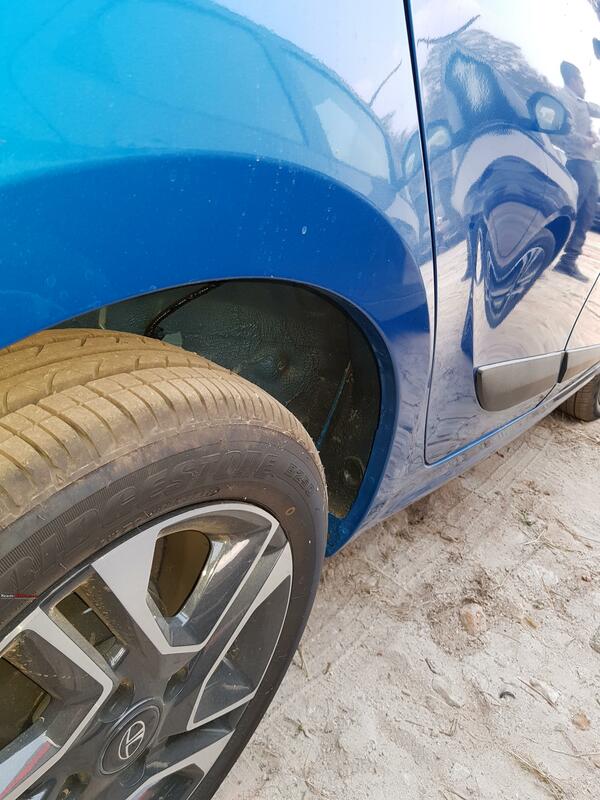 It may be that the rear wheel well cladding may be actually made functionally redundant. May be that they want to make the car lighter. May be, it is indeed a way to not to increase prices. There can be several reasons. Let's get to the root cause of it, before coming to any sort of conclusion. Thanks to Mohamed Fardeen for sending this information in. Thanks for sending this Mohamed Fardeen. Can imagine your frustration. That said, we also need to read this news (Tiago / Tigor gets standard dual airbags and ABS) alongside the cost reduction. Trying to balance it out by deleting other features across the range? Going by the Nexon episode, I'll also be keeping an eye on the GNCAP site. Wild hope though! PS: I'd rather have TATA motors increase prices rather than silently delete features, but I guess that's not how the entry level market thinks. Last edited by CrAzY dRiVeR : 11th February 2019 at 15:38. Sighting these stupid reasons to control costs, i ignored Maruti/Tata/Honda during my recent purchase. The most value for money proposition this time seemed none other than Ford which provided me the most safest car in its category by providing me with 6 airbags, ABS, TCS, ARP, auto dimming rear view mirror, climate control AC, automatic headlights, rain sensing wipers, rear washer/wiper/defogger, alloys, touchscreen with sync3 connectivity, rear camera with parking sensors and many more features at a mouth watering price of 7.5 lakhs on road in gurgaon. Obviously, it has full wheel cladding both at front and rear and with almost 96 BHP and 1200 CC engine, has the class leading average of 16 in city driving. It is one of the most fun to drive cars available in market as on date and always leaves a wide smile on my face. I remember back in 1998 when we got our first Maruti 800, it had all the farbic inserts in its doors. Now this fabric in door pad is considered premium in Swift and Baleno. One must not forget the flimsy build that they provide. Same goes with Honda as well where they adopted all cost cutting in Mobilio which costs 1 million. Not sure where are we heading towards. Coming back to the topic of cost cutting in Tata cars, they have become one of the most cost sensitive companies and are cutting corners in products which has brought them out from oblivion. Well, you can't really blame them for trying to survive in a tough market. Tata Motors has recently achieved the rare feat of becoming the company to report the largest quarterly loss in the history of Indian companies. Another feather in their cap. 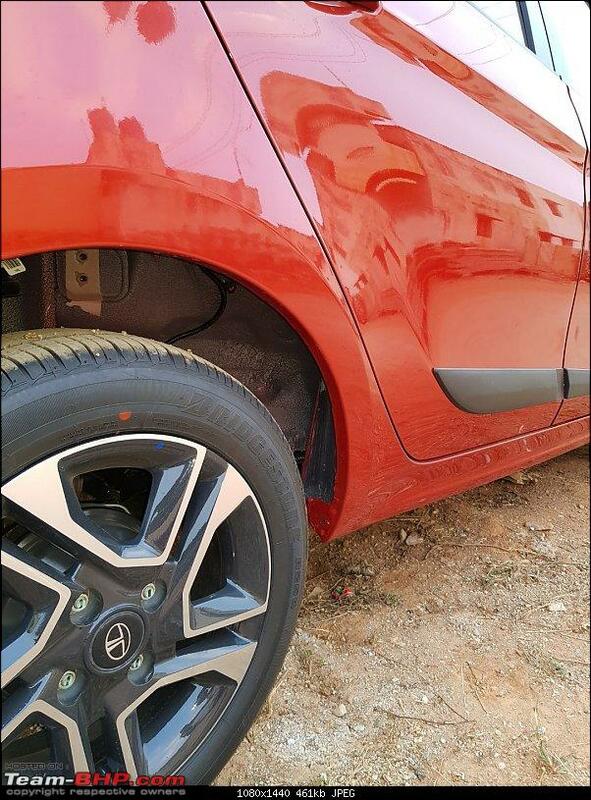 TATA did that during Diwali time, friend of mine bought another Tiago, and I noticed his Oct'18 Tiago misses on rear wheel well cladding. However his March'16 have it. Ford compromises on the safety structure with the current generation Figo platform - the 3 star rating doesn't make it the safest. The safest (GNCAP tested) choices around the price range are - 1. TATA Nexon - 5 star rating. 2. Toyota Etios / Liva - 4 star rating and 3. VW Polo - 4 star rating. Oops. Then it could be just cost cutting, and not related to addition of safety features in MY2019 models. By the way - any difference observed between the two cars, the way they drive? Last edited by CrAzY dRiVeR : 11th February 2019 at 18:00. Dear GTO, before we directly start calling them 'cheap' all out (For Hexa it's fine, but here I find it too strong a message), don't we need to analyse what is there on offer in the product itself and what the competition is offering? Aren't we talking of the same brand which is still selling us a better built (Relative term, Santro and Wagon R in question) car, which recently got the addition of ABS as a standard fitment? 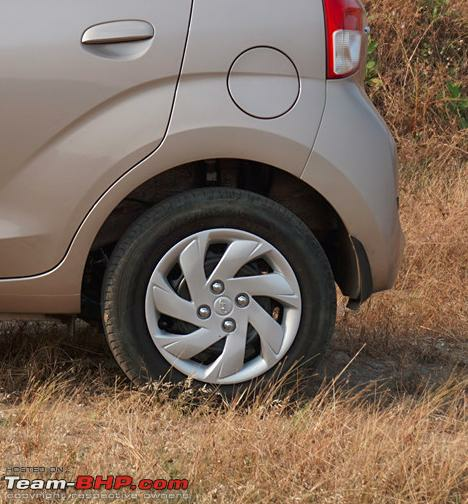 Here is the wheel well of the Santro, which is a more expensive product and doesn't even get the grab type door handles, no alloys, fixed headrests and what not. Did we call them 'cheap' in such a strong manner? Tata removed rear wheel well cladding. So what? Neither this car belong to that sensitive a segment where people will look at such minor details, nor are the competitors offering anything like that. Ya, new Wagon R has got the 1.2; but doesn't that make an 'already-coffin-on-wheels' even more dangerous? I don't see anything of that gigantic significance here after we conduct a quick competition analysis over which we need to directly call them cheap. Let's not forget that this is the same brand which is probably providing the best built options in the segment (In 2015, near my site a Tiago XZ had a head on with a Tata 407; the car was in mangles and occupants faced major injuries too - but coming out alive from that mishap in a small hatchback itself was a wonder to me, as I expected at least front occupants dead). The product is now coming with standard ABS, you get the best seats in the segment to stay comfortable on, best in class ride quality and a wonderful fuel efficiency. They are simply offering what is of max significance and have been further adding on. If they never offered the item (Rear wheel cladding) in the place, we would have been all appreciations for this baby Tata. What they have done is, simply remove the component they felt isn't needed because it's not something the target segment is bothered about. Last edited by VKumar : 12th February 2019 at 09:16.